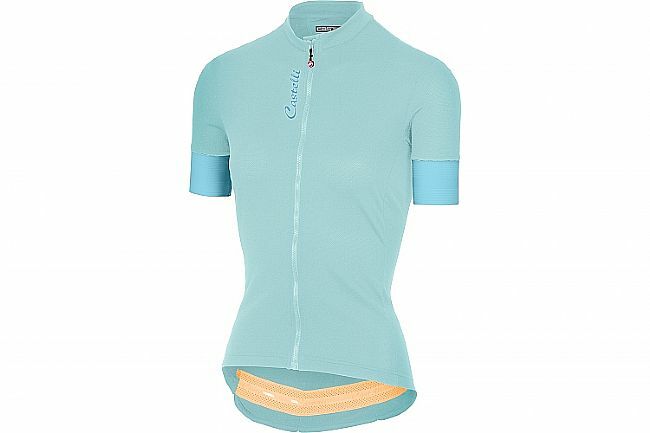 The Castelli Women's Anima 2 Full-Zip Jersey is designed to keep rider's cool and dry on warmer spring and summer rides. With plenty of performance-enhancing features, this jersey is at home on a high-speed training ride as it is a leisurely spin through the hills. Featuring a mix of Castelli's techinical fabrics, the jersey wicks moisture away from the skin to evaporate quickly, allowing for rapid cooling and dry riding. With its stretchy nature, the jersey sits close to the skin for increased comfort and performance, while the Prosecco hydrophilic treatment allows for moisture to spread over a wide area for increased evaporation. Out back, the Anima 2 features 3 rear pockets, a silicone gripper at the waist keeps the jersey planted, while a drop-tail design offers a little more coverage out back for a more comfortable fit.